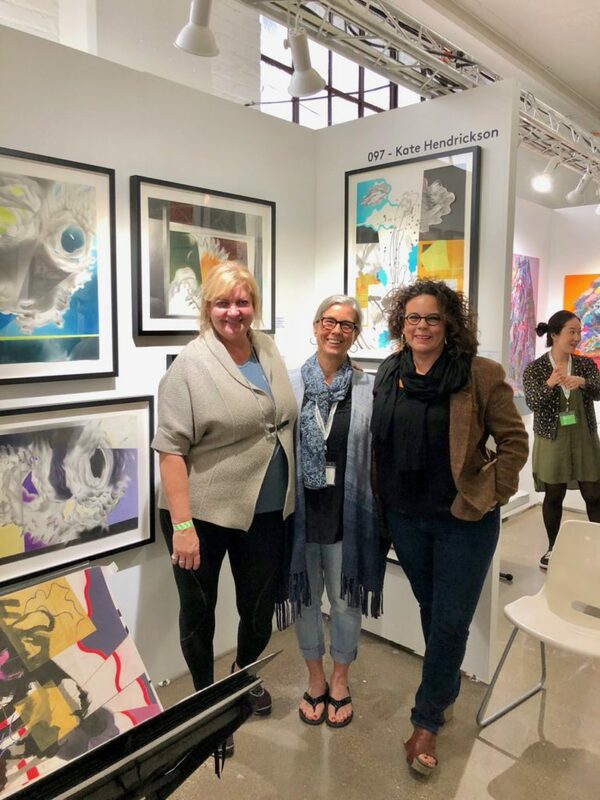 When the call to artists for the 2018 THE OTHER ART FAIR – CHICAGO presented by Saatchi Art was publicized, Pamela Staker and I were in full swing with our second round of collage collaborations. We decided to apply and agreed that if we both got accepted that we would share a stand. To our mutual delight, we both were juried into the fair. This would give us the opportunity to debut, “THE FIVE ELEMENTS” collaboration. To learn more, go to the blog “The Five Elements – Part 2”. 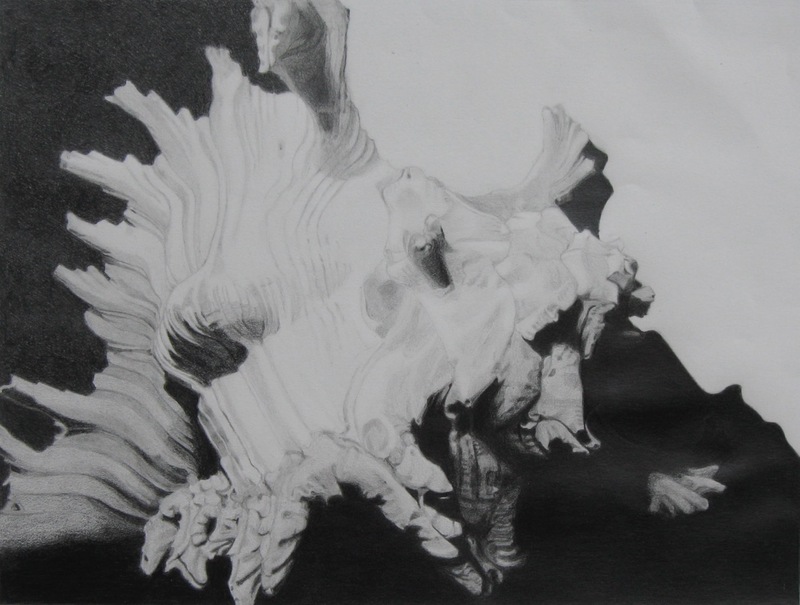 One hundred and twenty artists were chosen from a pool of seven hundred applicants. We anticipated the selection would bring together a diverse group of practitioners. They would contrast as well as complement each other by their creative vision and diverse material usage. 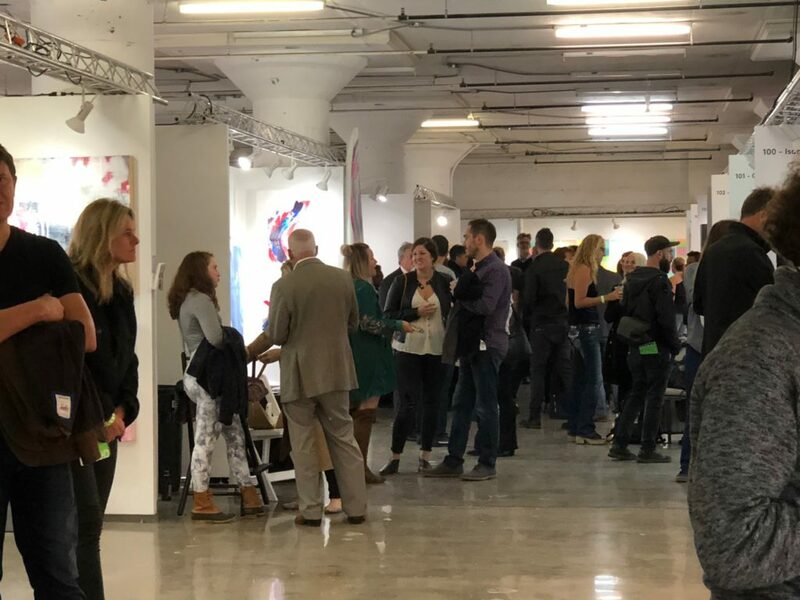 The venue would be held from September 28 thru 30, 2018 on the 4th floor of Mana Contemporary at 2233 S. Throop which intersects Cermak Road on the southern edge of the Pilsen neighborhood. Mana Chicago is a converted warehouse that accommodates artist studios as well as exhibition space. There are two other Mana locations, one in Jersey City and the other in Miami. 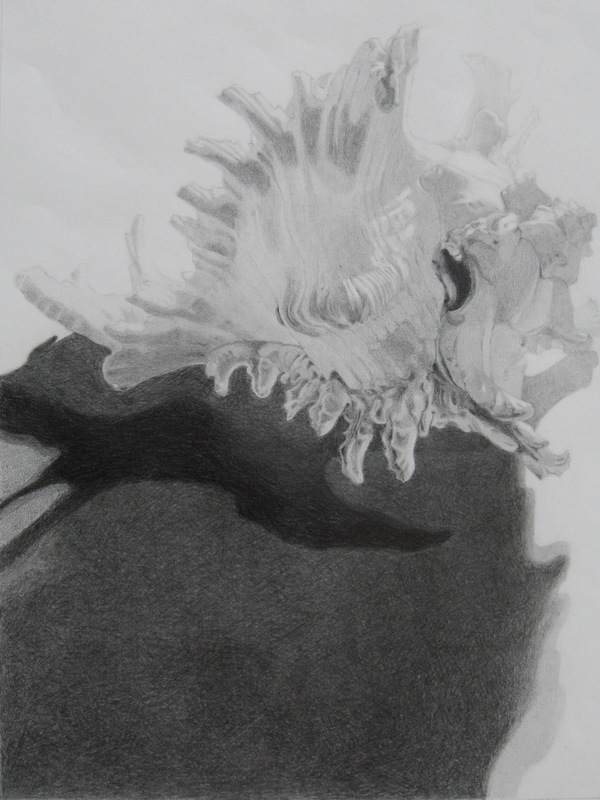 Packing up drawing for THE OTHER ART FAIR CHICAGO. Prior to the installation day, we created three possible scenarios for hanging the artwork. There was one to which we were leaning. 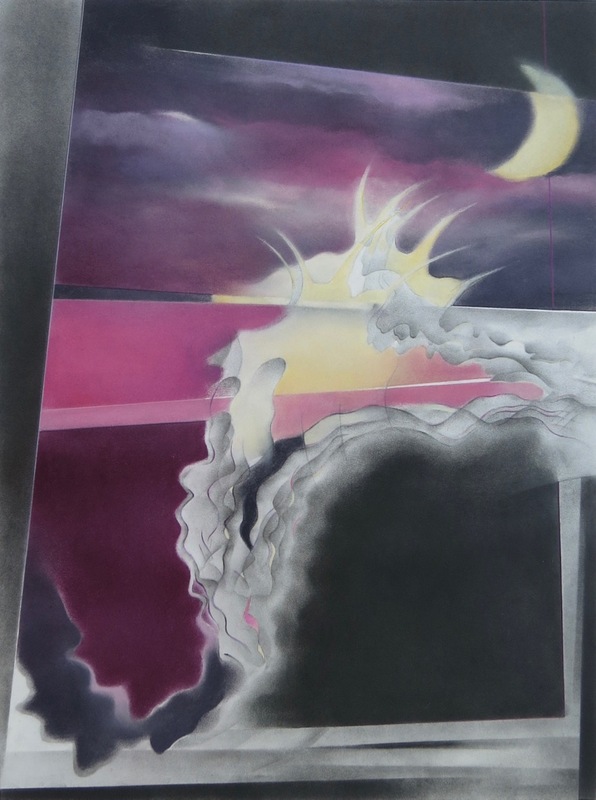 Pamela had decided to show one large painting and I would exhibit four of my drawings from the “Serendipitous Detour” series. We chose two pairs of our of the collaborative collages to display as well. We could not make up our minds so we planned to bring more art than what we needed. Hopefully that would to facilitate making the final decision. On the way to Mana Contemporary, I stopped at Pamela’s and helped her load the van she rented. It accommodated three large paintings, a couple portfolios, two chairs, a dolly and small cabinet. 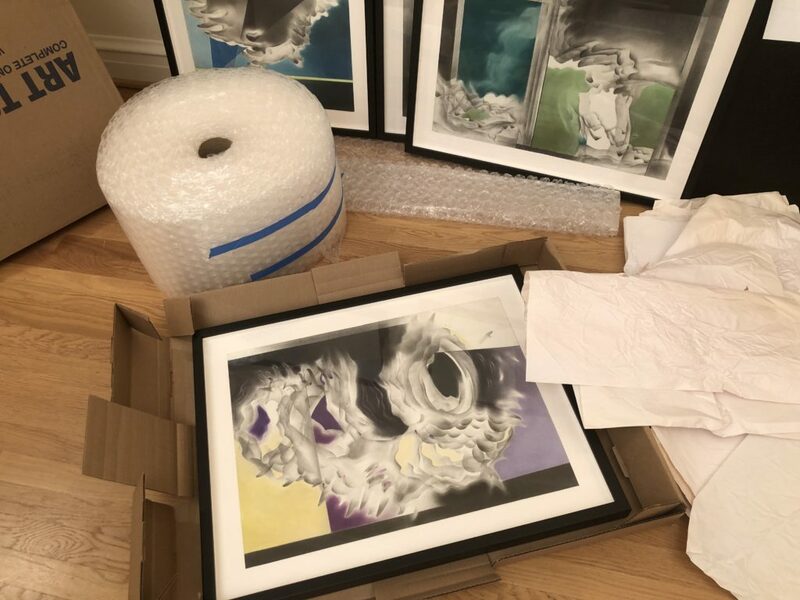 My car was filled with boxed framed works, several portfolios, a dolly and a print bin. We both then caravanned to the venue. Our first choice for the layout of the stand. 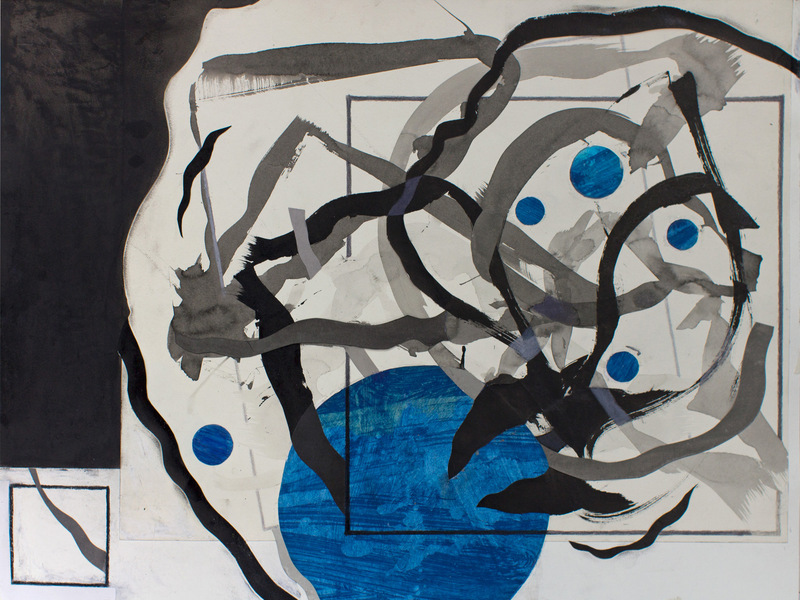 Staker-Hendrickson aka PAMKAT© on the left, “Float”/ “Midsummer Smile and on the right, “Anisoptera” / “Bristlecone Pine” – mixed media collages, 30″ x 22″. 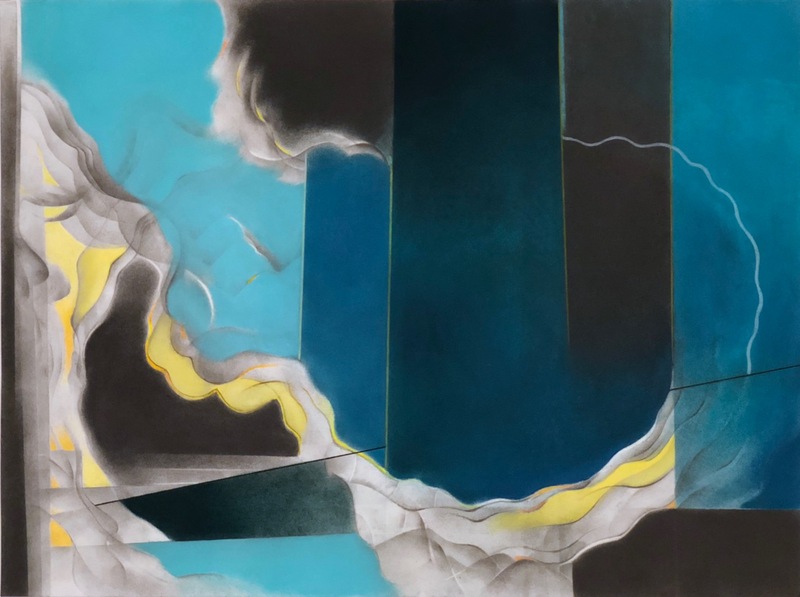 Center left, “Three Hands”, oil on canvas, 58″ x 58″ by Pamela Staker© Center right, “Twin Waterspouts”/ “Coastal Squall “/ “Reflected Cloudbank Sundown”/ ” The Tree of Simply Being” -pastel, graphite, colored pencil, either 24″ x 18″ or 18″ x 24″ by Kate Hendrickson©. We arrived just before 9am thinking that we would be standing in line to get to the 4th floor. The organization was seamless so there was very little wait. The entire day had been set aside for installation. So that meant artists could arrive throughout the hours as long as they were done by 7pm. 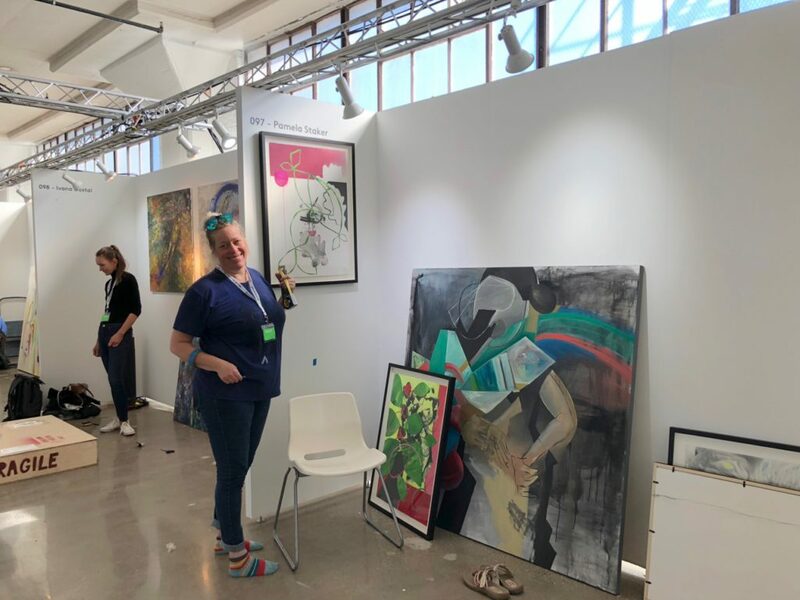 Once at the stand, we made the easy decision of placing the two pairs of collaborative collages, “Float”/ “Midsummer Smile” and “Anisoptera”/ “Bristlecone Pine” on the wing walls. We just had to determine which would be hung on the the right and on the left. Pamela had her three paintings and I, my eight framed drawings. Once I had selected my final four, Pamela was able to pick the painting she favored for the fair. In the end, we selected all of our original first choices. We learned not to second guess ourselves. Pamela was the super installer of the day with me aiding her as the assistant. We worked in synch. Pamela’s painting entitled, “Three Hands” was hung on the main wall on the left. My four drawings,“Twin Waterspouts”, “Coastal Squall”, “Reflected Cloudbank Sundown”, “The Tree of Simply Being” were placed on the right. So the visuals would be balanced, they were arranged in square format of approximately equal dimensions to the painting. When we finished the installation, we placed the chairs to either side, the print bin in the middle and the little cabinet in the left corner. I snapped pictures during the installation as well as the final placement. Satisfied with the look of the stand, we packed up the art not chosen. We were on our way out of the parking lot around noon. We now had the rest of the day to relax and finish up last minute errands before THE ARTIST PARTY at 8:30pm. We met our immediate neighboring artists who we would be seeing for the next 3 days. Cameron Ritcher, a youngster from Richmond, VA. and JJ Galloway, a seasoned THE OTHER ART FAIR exhibitor from Annapolis, MD were just across from us. Jihyun Ra, originally from Korean and now residing in the northern suburbs was to our left. All three are painters. The evening got off to a slow start but the exhibition space eventually filled with friends, family and other artists. They shared in the fun of the opening the fair. The musical entertainment enveloped the entire space. Everyone was clearly having a good time as they passed by to say hello. In retrospect, this day was quiet. The people we would have most liked to have seen at our stand did not come by. I feared that EXPOCHI at Navy Pier kept them away even though that fair’s professional day was Thursday. However, the evening’s PREVIEW PARTY was another story. 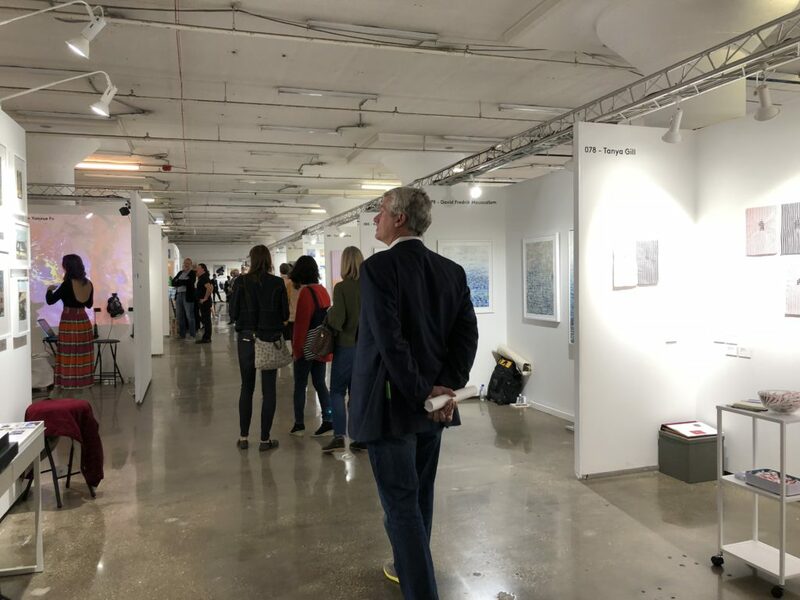 From the start, it was packed with fair visitors who began their experience with 30 second plays presented by The Neo-Futurists in immense freight elevators as they ascended to the 4th floor. These little plays were performed through out the weekend as well. With a continuous stream of party goers, there was not a moment to relax. The music pumped the excitement of the festivities. Kate and Pamela with interior designer, Carole Post. VIP DAY with visitors viewing the stands. The crowd at the Preview Party Evening. Both days were electric with visitors. They stopped by the stand to view the artwork and hear about what we were doing. Those we knew also passed by to wish us well and see what was new. The attendance was the Preview Party all day instead of just a few hours. There was not a moment during either day that the crowd thinned. The public seemed engaged and genuinely interested in learning about the artists and their work. We got some good leads and made connections to add to our mailing lists. What happens post fair will determine how successful it was for us. 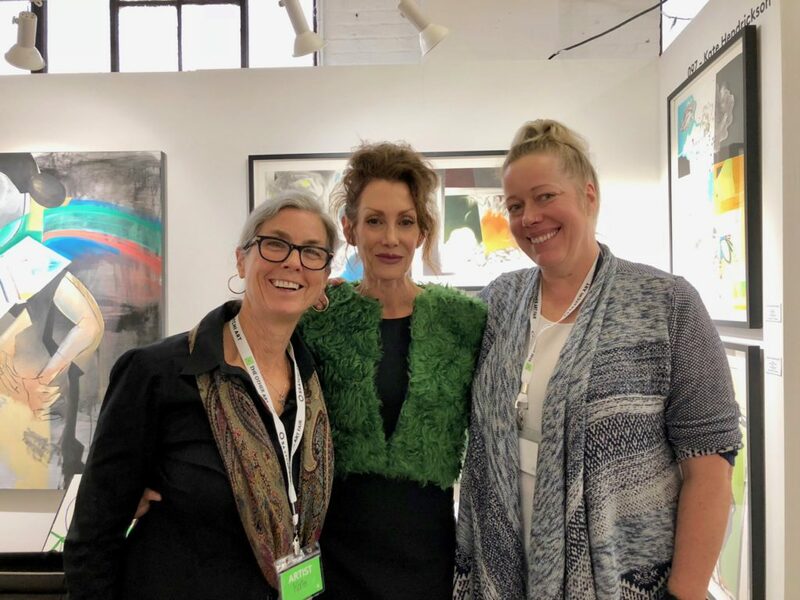 Alison Helm, Director of the School of Art and Design and Jennifer Jordan, Director of Development for the College of Creative Arts from my alma mater, West Virginia University stopped by the stand. Pamela’s brother, Ben stopped by with his wife, Adrianna who took this picture of the three of us. Everyone participating in the fair was super professional. The manner of how the stands were installed to how the artists presented themselves supported this observation. 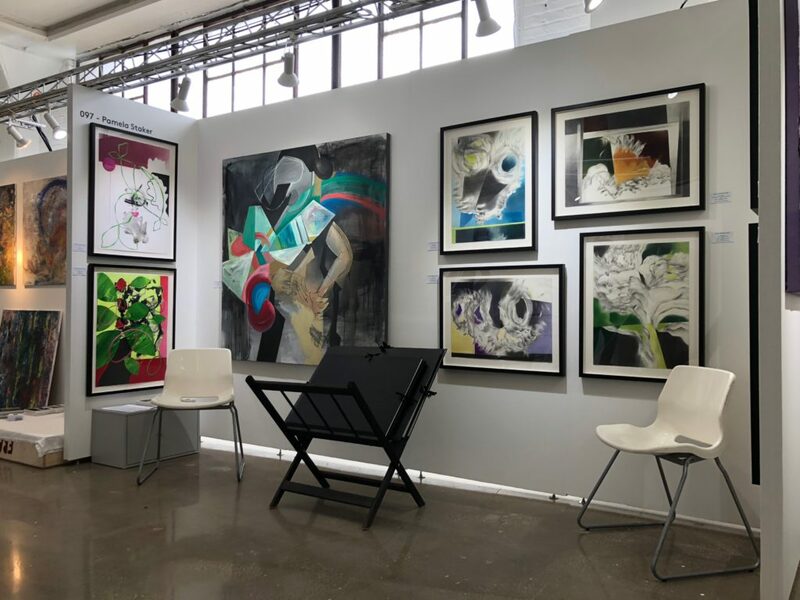 To find most of the artists who exhibited at the fair go to: THE OTHER ART FAIR – Chicago I would also like to mention that the support staff under the direction of Sophie Lucas and Laura Skudder was attentive from notification of acceptance through to the end of the fair. On the last day, Kate and Pamela are still having a good time despite being on their feet for three days. When the fair closed, it came time to pack up our artwork, put it on dollies and roll it out. The efficiency factor of the TOAF organization delivered us from the building quickly to load our vehicles. We were on our way home in a little over an hour. Despite the long hours and the new friendships developed with our neighboring artists, the surreal departure brought about an anti-climactic finish to the weekend. 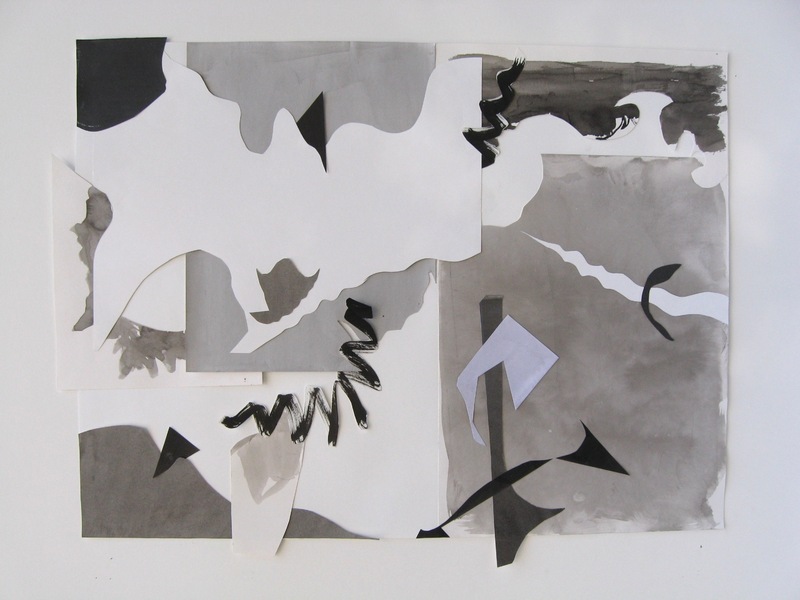 All collaborative collages are posted on my web-site and on Pamela’s web-site. 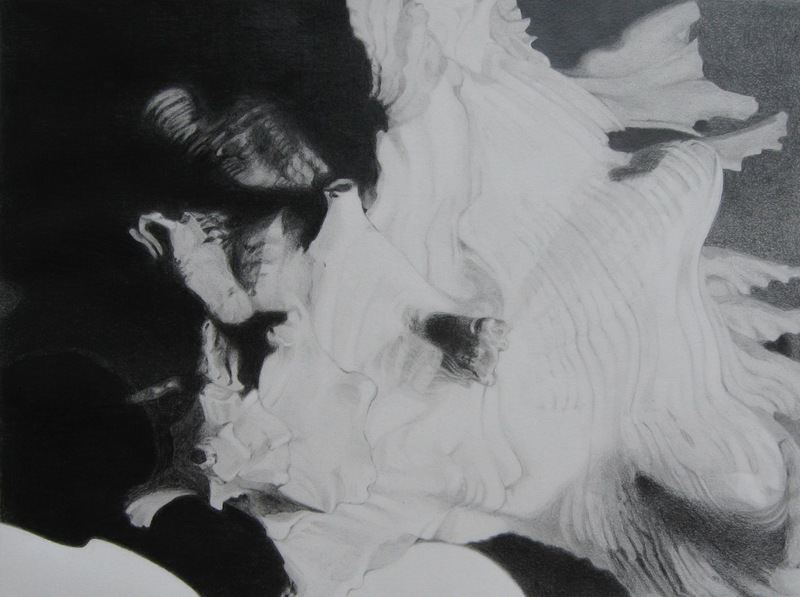 You can see also see PAMKAT on SAATCHI ART. 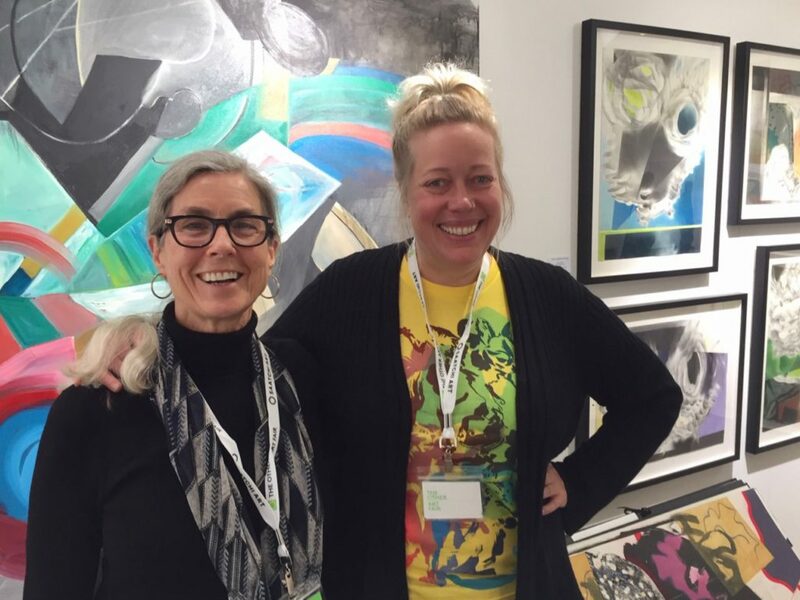 I should mention that we have decided to create a signature name for our collaboration which combines our first names so that in the future when you see our pseudonym, PAMKAT you will know that it was created by us, Pamela Staker and Kate Hendrickson.